You can add new users and change permissions for those users easily by following the below steps. 4. Scroll to the bottom of the page and click Create New User. Fill out the new user information and select which lists you want the user to have access to. NOTE: Username, Password, First Name, Email, and access to at least one list is required. 6. Select access permissions for the user. A description of the each option can be found below. Author Access: allows the user to create and send messages to any available lists. The Home, Authoring, Retail Solutions, and Support tabs will be available when used alone. Analytics Access: allows the user to view message, contact, and list-level analytics for any available lists. The Home, Analytics, Retails Solutions, and Support tabs will be available when used alone. Settings Access: allows the user to access setting pages under navigation tabs. Must be used in conjunction with another privilege such as Manage Access. The Home, Retails Solutions, and Support tabs will be available when used alone. 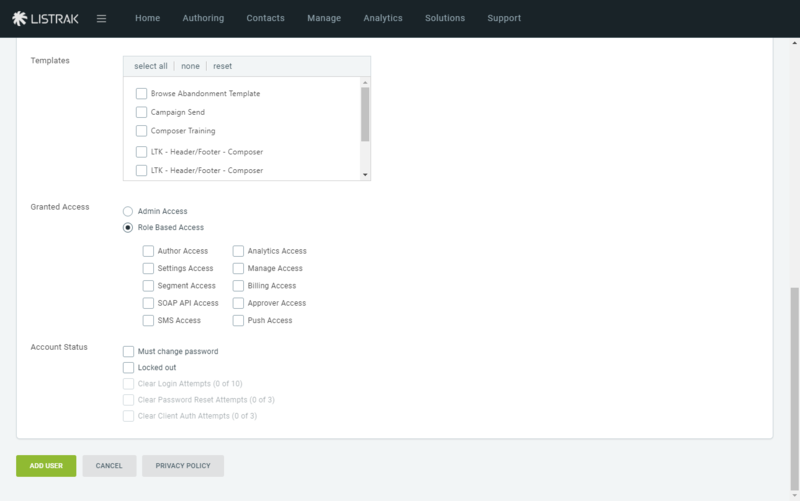 Manage Access: allows the user to create, delete, and maintain any available lists. Use in conjunction with Settings Access to modify list settings. The Home, Contacts, Manage,Retails Solutions, and Support tabs will be available when used alone. 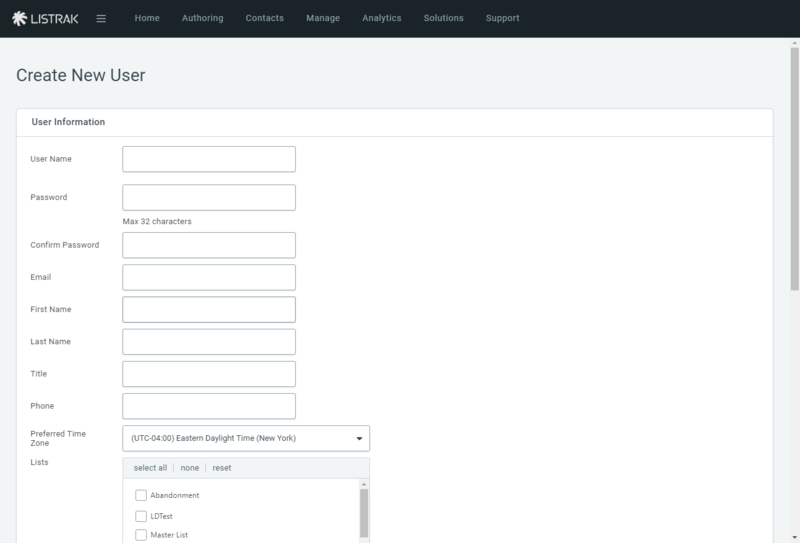 Segment Access: allows the user to create and/or modify segments and field groups for any available lists. Must be used in conjunction with another privilege such as Manage Access. The Home, Retails Solutions, and Support tabs will be available when used alone. Billing Access: allows the user to view and pay invoices for the Listrak account. Must be used in conjunction with Manage Access. The Home, Retails Solutions, and Support tabs will be available when used alone. API Access: allows the user to perform programmatic API calls for any available lists. Must be used in conjunction with other privileges. The Home, Retails Solutions, and Support tabs will be available when used alone. Approver Access: allows the user to be selected as an approver on the list settings page for any available lists. The Home, Retails Solutions, and Support tabs will be available when used alone. 7. Once you've checked off all of the user's access options, click Add User.